Taylor Morrison launches interactive quiz to help prospective home buyers. 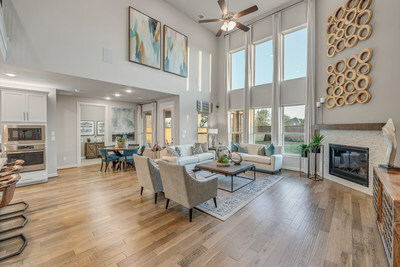 Taylor Morrison’s Sapphire Model in the master-planned community of Cane island in popular Katy, TX. SCOTTSDALE, Ariz., Nov. 14, 2018 /PRNewswire/ -- With thoughtfully planned home designs available throughout the United States, uncovering that perfect match worthy of the name "home" can be a little overwhelming. Using the newly launched tool, Spectacular Spaces, a future homebuyer takes a short interactive quiz taking them on a journey with questions about their lifestyle including cooking habits, their idea of a perfect Saturday night and even how they get their movie fix. "Our goal is to find you a dream home and community that matches your personal criteria and lifestyle," said Taylor Morrison Chairman and CEO Sheryl Palmer. "This quick and interactive Q&A is the first step in taking out the guesswork on where to hang your hat at the end of the day. Who knows, you may find out more about your style than you thought?" The new web search functionality aims to make the homebuying experience easier and more enjoyable for home shoppers, starting where most homebuying journeys begin—online. Website visitors are asked a series of 10 quick and easy questions. This helps Taylor Morrison learn more about them and generate instant tailored results selecting the builder's best floor plans. While the quiz is certainly playful, the goal is to help the builder deliver a targeted list of homes, in the homebuyer's preferred location. Since its soft launch in late October, more than 7,000 people have taken the interactive quiz, tripling the time buyers are spending on the builder's website when they find the quiz organically. Visitors are also exploring more of Taylor Morrison's home offerings, with the Spectacular Spaces quiz reducing early exits from the website by as much as 80 percent. A few key trends have emerged from the more than 7,000 quiz participants, such as two-thirds of respondents (67 percent) wanting a one-story home and 45 percent needing three or more bedrooms. The large majority of home shoppers are dog owners (83 percent) and another 74 percent are aspiring chefs, preferring gourmet kitchens. Thirty-nine percent of quiz participants work from home, and when it comes to the perfect Saturday, a pool and Netflix (61 percent and 52 percent, respectively) lead the preferred leisurely activities. Gourmet kitchens, elegant bathrooms, spacious storage options and special design touches all come together to create home designs that have helped Taylor Morrison become not only a market leader but also America's Most Trusted® Homebuilder according to Lifestory Research for three straight years.